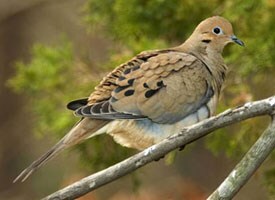 A mourning dove, symbol of peace. A woman wanted to do something about the annoying doves that cooed behind her house. She bought a wrist rocket slingshot and some malted milk balls, then went to her backyard to hit the birds that were making her miserable. Oh, she was wrong, of course. She would always be miserable. And angry. But still she tried to hit them. Hard. with the malted milk balls. But try as she might, she couldn’t. The balls were too light, perhaps, and they always curved one way or the other when she shot them. The birds, on the other hand, did not fly away, but sat on the wires making their distinctive sounds. She gave up at last. The wires were too far above the alley. Even when she pulled the wrist rocket rubbers back as far as she could, she had to shoot the balls in a high trajectory that always veered one way or the other. She ended up pelting her neighbor’s house on the other side of the block. Perplexed, she went indoors to fix herself a sandwich and to search the internet. She settled on a dual attack. She would scatter sunflower seeds on the ground so that her cat could catch the doves. She would also put bobble-head owl figures on her garage to scare them away. Her neighbor across the alley who had endured the rain of candy on his roof watched her as she climbed on her garage. He decided that she was spying on him with tiny cameras within the owl figures. After all, why else would this angry old woman be climbing upon her garage where she could look down on his back yard? Soon our angry person got a visit from a police officer to investigate a complaint about the candy that she had been firing with her sling shot and whether she put secret cameras on her garage to invade her neighbor’s privacy. The policeman was skeptical when she told him she had been trying to scare away doves. He wondered about her mental health. He asked her if she believed she was a threat to others or herself. She managed to explain herself to the policeman. Even so, he left her with a citation and a notice to appear in court because she was accused of being a nuisance to her neighbors. Turns out firing a wrist rocket within the city is a misdemeanor. But the policeman had given her an idea. Back in her house on the internet, she was investigating purchasing a hawk. « My difficult life in Billings, Montana.